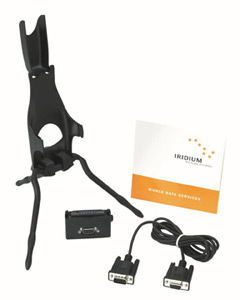 This Iridium 9505a Data Kit contains the hardware and software required to establish an Iridium data call with Iridium 9505a satellite phones via computer's serial port. Data Adapter: attaches to the Iridium 9505a phone and provides a connection for a serial cable. Allows simultaneous connection of the AC Travel Charger, Auto Accessory Adapter or Solar Charger. Stand: Supports the Iridium phone and allows the antenna to be oriented in a vertical position. Serial Cable: connects the Data Adapter to a computer serial port. Iridium World Data Services CD-ROM: Contains all software and documentation required to install and configure Iridium World Data Services on your computer. Documentation includes user guides, troubleshooting guides and application notes.